When a TV is connected to computer running elementary OS/Ubuntu/Linux Mint through HDMI cable, it is observed that audio will not pass through the HDMI. Eventually, the audio keeps playing in the computer’s speakers. Video will still work good in the extended monitor or the TV, but no audio in it, which implies you can’t enjoy the digital 5.1 surround sound on your home theater. This problem is seen in elementary OS, Ubuntu, Linux Mint and other Debian based Linux distributions. Fortunately, the fix is simple and there is no need to install additional drivers or make huge changes to configuration. IMPORTANT: Before proceeding make sure that you have connected the computer to the TV or the additional monitor through HDMI cable. You should be seeing the desktop background on your TV. So let’s check if by chance your computer identifies the HDMI audio. This fix is tested to be working on elementary OS, Ubuntu, and Linux Mint. 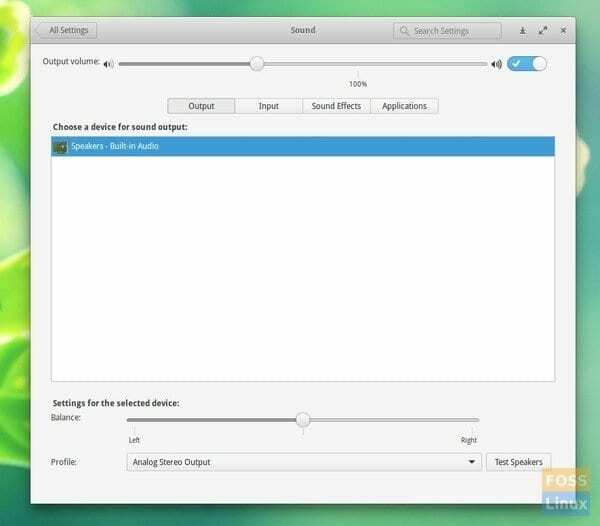 Keeping the HDMI connected to TV, click on the ‘Speaker’ icon on the elementary OS taskbar and click ‘Sound Settings’. Click on the ‘Output’ tab. If you see HDMI audio there, select it and in such case you should see ‘Digital Surround 5.1 (HDMI) Output’ profile at the bottom of same dialog box. This is not typically seen in most of computers and hence need for this article. If you are successful, you are the luckiest and thanks for being here! Launch ‘Terminal’ and type the following command. Make sure to replace “YOURUSERNAME” With your user name. It will say that the audio group already exists. But, the trick is the permissions is now freshly added with the HDMI audio profile. Close all applications and now restart the computer. After restart is completed, connect HDMI cable to TV, click on speaker again and go to ‘Sound Settings’. You should be seeing the ‘HDMI/DisplayPort 2 – Built-in Audio’ or something similar in the ‘Choose a device for sound output’ section. If your computer or laptop has Surround sound decoder, you should additionally see ‘Digital Surround 5.1 (HDMI) Output’ in the profile section. You can click on ‘Test Speakers’ and check for surround surround through speakers across all channels. Updating the programs is a great way to keep your system top notch with all the new toys and tricks. Updates are significant. They provide new features, features you think are amazing, and often comes with revamped interfaces too. If you could resolve the problem of sound for Remix OS through HDMI – it would be fantastic. I didn’t get chance to look at Remix OS. I did hear about it and hope to try it out soon. Regarding the Linux Distro with Android Apps support, I think there are few popular ones out there. “Shashlik” is a good Android emulator, and it’s free too. ‘Anbox’ is another one which is still in very early phase of development, but looks promising due to their non-emulator approach. I’m not sure what you meant by ..for TV, but did you try Kodi media player? It is one of the best media players out there that is highly optimized for home entertainment. Running Kodi on a ARM board like Rasberry Pi with IR remote capability is a powerful media player for your TV/Home Theatre. I have followed the instruction above but still don’t get audio through HDMI. Thank you thank you. This simple fix did seem to finally fix the issues I was having with no audio through HDMI connection. Didn’t seem to do anything for me. It’s frustrating as I had no issue with this until I updated to the Juno build. Hi Bob! Did you follow the instructions exactly? I did not do it the first time! After “sudo adduser $ YOURUSERNAME audio”, the computer must be restarted with the HDMI cable disconnected! After restart is completed, connect HDMI cable. Thank you very much! Audio through HDMI now works! I’ve tried everything but attempting to load new drivers. Sound shows my Radeon HD as an HDMI entry in sound, but nothing I do will actually use it. Sound test: fails. All the tricks listed here: fails. Tricks from other sites: failed. Please, any help would be greatly appreciated! The fix above did not work. I’ve added my use to the audio group but still no sound.